Oooh, I love this new book! The authors are women and members of The Church of Jesus Christ of Latter-day Saints. They have recently published it, so between Mother’s Day and Father’s Day, they are having a virtual book tour to promote it. As part of the book tour, I am reviewing it. This book is so lovely, from the gorgeous cover to the stories and quotes and thoughts inside the pages. This book is a must-read for every pregnant or new LDS mom, or even an older menopausal mom, to assist you in mentoring your daughters and daughters in law in giving birth to your grandbabies. This is my new favorite birth book! Many times when I am pregnant, I read a book about birth to guide me. It was 19 years ago this summer that I was pregnant with my firstborn. I took a book with me every day to my job as a lab technician at the University of Utah Medical School to read on my lunch break. I guess I need more omega-3s because my memory is failing me and I can’t even remember a single title! Wait, I think maybe one was Martha and Dr. Sears’ The Birth Book. Oh, and another was What to Expect When You’re Expecting (which I don’t really recommend now) and another was What To Eat While You Are Expecting. Despite that book’s problems (see critique here http://www.westonaprice.org/childrens-health/modern-baby-books , and more on nutrition and pregnancy at the bottom of this post) it did advocate avoiding white sugar, which motivated me to get off sugar. And my 18 year old son is very smart. Perhaps it’s because of the lack of white sugar in my pregnancy diet with him. I have periods of time on and off sugar, but that was one of the longest times I stayed off. I do remember reading Dr. Bradley’s book, Husband Coached Childbirth when pregnant with Baby #2 for my Bradley class (and yes, I had a “Bradley birth”), Mind Over Labor by Carl Jones with Baby #4 (what’s with it with these birth books written by men? They can’t speak with personal experience…) and Ina May’s Guide to Childbirth. That by far was my favorite book on childbirth until this book eclipsed it! I absolutely love the book’s premise, that the phrase in the Proclamation on the Family from the Church of Jesus Christ of Latter-day Saints about the “the means by which mortal life is created to be divinely appointed.” also involves the process of pregnancy and giving birth. These are divinely appointed processes, worthy of every honor we give them. I had never thought about that before, that this phrase refers to more than just procreation, but pregnancy and birth. In a serendipitous turn of events, that could only come about because God lives and communicates in layers of symbols and brings like-minded people together, this book speaks about what my web site here is all about. My web site you are reading here is all about the connection between trees and life and Jesus and mothers. The Gift of Giving Life shares that the Grand Giver of Life of Us All, our Heavenly Mother, is symbolized by trees. Jesus Christ, our Savior, is the Tree of Life. Just as the Savior does things for us that no one else can, that is why He is our Savior, mothers can do things for their babies and children that no one else can. Only we can labor for them, nourish them with our milk, an intervene and cheer for them like no one else. So we as mothers are literal saviors to our babies, or trees of life to our babies. Not just in physical ways, but in emotional and spiritual ways. We can do things for our child’s whole life that only we can do. This is so empowering, to know that we have the honor to be our children’s heroes! I especially love the story on p. 353 by Carol Vezzani that vividly describes how the labor process can parallel the process the Savior went through with the Atonement. I have pondered that parallel often and it is nice to see it in print here. Thank you Carol! I feel promise for healing as I read it, because I have had some traumatic natural births, (which led me to do a hospital birth after four natural home births) and I know Carol’s insights will help me in my next birth. The book features a whole chapter on the connection between the Atonement and childbirth. I love the mention in the beginning of the book of Heavenly Mother, and that she is often symbolized by a tree. Makes total sense, as it harmonizes with my research that I put into writing my book (access the first volume, Tree of Life Mothering, HERE and go to chapters 2 and 3). My book shows the many examples of the tree structure in a mother’s body: the respiratory system, the circulatory system, the placenta, and the breasts. Fascinating! this illustration comes from the blog post written by Heather, referenced in the link below. OK, so back to the review of this birth book. One of the authors, Heather Farrell, has a chapter that explores the tree concept. It is so beautiful and fits right into my teachings in my book. 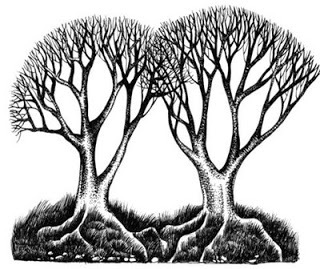 In the garden of Eden, we had two trees, two people, and two veils. Each of these are highly, beautifully symbolic and are evidence of a Grand Creator. Here’s a link to Heather’s blog that has this chapter as a blog post http://womeninthescriptures.blogspot.com/search?q=two+trees. Thank you Heather for these amazing insights that complement my writing! I love the quote shared by Erastus Snow about Heavenly Father and Mother. I was going to type it in but you are just going to have to get the book to read it because I am running out of time and have to fix dinner soon! This book is not advocating any one kind of birth. All kinds of birth are mentioned: hospital, home birth, C-section, natural, breech. The point is to respect all kinds of birth and to get readers to appreciate the tremendous gift women have of giving life. I appreciate the verbatim quote of the LDS Church stand against surgical sterilization and tubal ligation as forms of birth control, as put forth in the handbook. I wish that the book discussed more about the range of birth control options, in terms of which ones can kill life and which ones honor life. I love that the book talks about breastfeeding, and the spiritual symbolism of breastfeeding in terms of the Savior and the sacrament. Beautiful! I love all the stories! I have cried over reading some of them, smearing my mascara. They are that touching! Whatever your pregnancy or birth history, you will be touched by one of the stories, about unplanned pregnancies, planned pregnancies, giving birth as a single mom, a mother giving up her baby for adoption, infertility, repeated miscarriages, and stillbirth. I greatly appreciate the material in the book that addresses topics I’ve never seen much in a book for LDS women before: pre and post-partum depression, and healing from sexual abuse. I like the stories of parents feeling the spirit of the baby before birth, feeling the presence of angels, and even seeing the spirit of the baby before birth. This book truly is a must-read for every pregnant LDS mom, every LDS woman who plans to give birth, and every LDS older mom who wants to support her daughter or daughter-in-law through the birth process. So go get yours today! 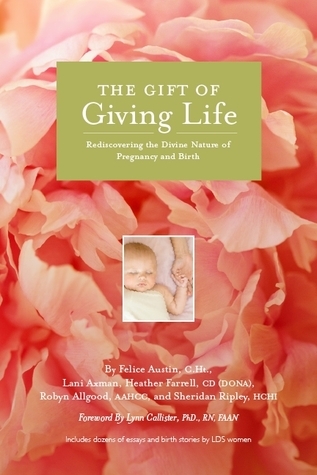 Go here to get a coupon and order http://thegiftofgivinglife.com/virtual-book-tour Give it to an LDS woman for Father’s Day in honor of her husband and their power to give life together! The only drawbacks to this book are that I wish it mentioned more about the importance of nutrition in pregnancy, and the power that women have to mold bodies that are stronger for life because of the food we eat while pregnant, so that we and our babies have proper gut ecology. Gut ecology affects all aspects of health. Women really are fountains of life, and the better we eat when pregnant, the more quality of life we can give our babies. (I am not writing this to induce guilt in anyone, but to share what I’ve learned to impact us from this moment forward.) The book does have a chapter on constant nourishment and a story about diet but doesn’t mention the importance of the sacred traditional fats that are so important to fertility (ability to even get pregnant) and the creation of healthy babies who are free of birth defects, impacted wisdom teeth, autism, allergies, ADD, the need for glasses later on in life, mental problems, and more. See http://www.westonaprice.org/childrens-health/diet-for-pregnant-and-nursing-mothers. Our future is in the hands of the young women and future mothers of this world. This fact gives us a whole new way of looking at what’s important, and who most needs our support—it is the young women and future mothers. And the role of all the rest of us as parents, siblings, as partners and husbands, as aunts, uncles and grandparents, is to provide whatever support is necessary to these young women, whether it’s information, whether it’s the food itself, whether it’s financial support or emotional support. For example, I love the idea of raw milk grannies–grandmothers being the ones who bring the raw milk every week for their children and grandchildren. Today we are seeing an epidemic of behavior problems and learning disorders in our children. While treatment of these conditions is very costly for our society—not only in terms of the financial cost, but also in terms of emotional cost—very little attention is focused on diet and nutrition for the treatment—and prevention—of these tragic conditions. The second drawback to this book is that it wasn’t around when I was pregnant with all my babies! It is truly a treasure. A HUGE thank you to Heather, Felice, Sheridan, Robyn, and Lani! Thanks for giving birth to this book, I can tell it was a labor of love. This entry was posted in birth, pregnancy and tagged birth stories by LDS women, childbirth, nutrition in pregnancy, pregnancy, the gift of giving life. Bookmark the permalink.